American Crew are the original game-changers for men&apos;s grooming products. Not content with the product offerings available that didn&apos;t take into account the unique needs of men, American Crew set about designing products by trusted hair stylists. Ditch the giant tubs of hair goop you bought at the supermarket. WIth technologically advanced formulations, American Crew started in 1994 when men&apos;s hair stylist David Raccuglia walked into a distributor&apos;s Chicago office, holding a bottle of maple syrup. Raccuglia asked for $25,000 to produce the first run of shampoo that the industry sorely needed - the maple syrup to represent the deep masculine, mahogany colour that the range was destined to be. A forward thinker, Raccuglia knew that it was time for men&apos;s needs to be represented in the haircare world. Today, American Crew represents the latest formulas and the most forward-thinking of textures. Whether today&apos;s look is a sleek men&apos;s cut, or a tousled, effortlessly masculine look, American Crew is a range by men and for men. Combining products that are quick and easy to use, with product education and insight. With a personalised experience in men&apos;s grooming, American Crew give men a fresh start on developing their individual looks. Trusted by hair stylists for men. 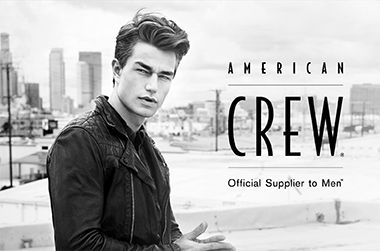 American Crew is a professional men&apos;s haircare range, with products that protect and gently care for the hair. Whether it&apos;s American Crew&apos;s best-selling, iconic shampoo American Crew Thickening Shampoo, or the versatile men&apos;s hair styling cream American Crew Texture Paste, every day can be a good hair day without having to try too hard. Buy American Crew online with Adore Beauty. Free Australian Express Post on all orders over $50, and free samples are available. Showing 20 products of 26. My BF loves this product, he says it&apos;s suuper moisturising and good value!